Cindy Chao’s museum-calibre Black Label Masterpieces combine the rarest of gemstones with exceptional design. 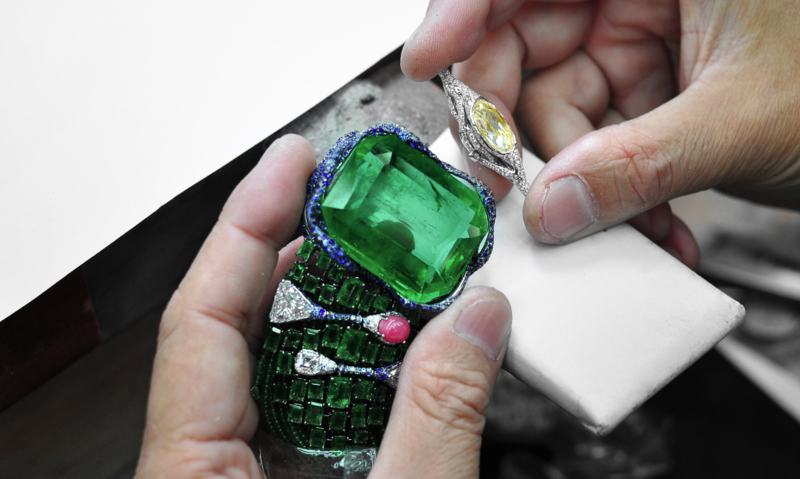 Created in limited edition and often taking more than 1,000 hours to bring to life, they are highly sought-after by jewellery connoisseurs worldwide. To her fans’ delight, Chao is one of 40 newcomers exhibiting at this year’s European Fine Art Fair (TEFAF) in the Dutch city of Maastricht. One of the most esteemed organisations in the world of fine art, antiques and design, TEFAF runs three prestigious fairs a year—the Maastricht event, which takes place this month, and two in New York. A shift towards modern and contemporary galleries has seen a rise in the number of jewellers that show their collections at TEFAF, but Cindy Chao: The Art Jewel is the only high jewellery brand to join its Haute Joaillerie section at this year’s Maastricht edition. The collection unveiled at TEFAF by Chao, the granddaughter of an architect and daughter of a sculptor, celebrates her family’s legacy. Her 2019 Black Label Masterpieces are delicately showcased on a sculpture Chao calls Tree of Life, each piece drenched in diamonds and bursting with colour. Founded in 2004, Cindy Chao: The Art Jewel is renowned for using an 18th-century European artisanal technique of wax sculpting in developing designs. Standouts pieces from Chao’s 2019 unveiling include two Royal Feather Brooches. Inspired by the whimsical bluebird, each brooch features a heart-shaped diamond, one of 8.6 and the other of 7 carats. Crafted in a sky-blue titanium, they’re exceptionally light—25 and 35 grams—despite boasting 750 pieces of sapphire in nine colours and five cuts. Chao’s first feather brooch, the 2016 Black Label Masterpiece XVI Phoenix Feather Brooch, sold for US$1.2 million at Christie’s Hong Kong in 2017. Other pieces revealed at this year’s showcase included the 2019 Black Label Masterpiece VI Scultura di Giglio Bangle, which pays tribute to the Renaissance sculptor Michelangelo. “Michelangelo once said, ‘I saw the angel in the marble and carved until I set him free.’ This echoes with my creative philosophy,” says Chao about the piece. “When I do wax sculpting, my thought is always to create impeccable pieces by removing unnecessary material.” A spectacular creation, the bangle features 4,428 pieces of diamonds, fancy-coloured diamonds and sapphires weighing 180 carats. Meanwhile, the 2019 Black Label Masterpiece II Marguerite Brooch is notable for its 84.89-carat cabochon emerald, and the 2019 Black Label Masterpiece VIII Ribbon Brooch is remarkably thin. The 1mm thick titanium base supports 3,600 pieces of diamonds, sapphires, tsavorites, alexandrites and blue spinels weighing a total of 120 carats. Last but not least, the 2019 Black Label Masterpiece VII Emerald Architectural Necklace is a homage to Chao’s architect grandfather. A pair of emerald-cut Colombian emeralds of 100 and 99 carats are surrounded by 10,000 pieces of vivid green emerald beads. A superb finale, as is to be expected from an artisan as skilled as Chao.